Organizations that do not ‘catch the Big Data Analytics train’ run the risk of falling behind. According to the European Commission the value of European citizens’ personal data has the potential to grow to nearly € 1 trillion a year by 2020. The value of European citizens’ personal has the potential to grow to nearly €1 trillion annuallyby 2020. Lawmakers around the globe, responding to many well-publicized situations and concerns expressed by citizens, have become more and more focused and concerned with privacy matters. An important development in this respect is the current reform of the European Union’s (EU) data protection legislation framework which revolves around the adoption of a new ‘General Data Protection Regulation (hereinafter referred to as ‘the Regulation’). The Regulation will replace the current European Data Protection Directive (EU Directive 95/46/EC6) and was adopted in April 2016. It shall be enforced on May 25th of 2018. It will bring major changes to data protection legislation in Europe. 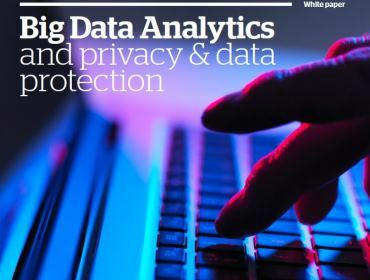 This White Paper explains how organizations can significantly improve their efficiency and offerings with Big Data Analytics while implementing the relevant privacy & data protection principles and rules. Leverage our agile consulting methodologies and proof-of-value sprints to transform data into profitable business insight.